Common Sense Media (http://www.commonsensemedia.org) has been working to provide parents and families with the information they need to make decisions on the appropriate media for their consumption. They have been providing reviews for movie, books, television shows, games, apps, and music since 2003. Their education wing has recently released their new site that does something very similar for teachers. That site is Graphite (http://www.graphite.org). Graphite provides comprehensive reviews of apps, websites, and other digital learning tools for teachers in the areas of engagement, pedagogy, and support. Each review provides pros, cons, and a bottom line to quickly see if a teacher is interested in the product. They then go in depth with reviews that explain, “What’s It Like?,” “Is It Good For Learning?,” and “How Can Teachers Use It?” Subject area, skills, and who or what they would be great for or with categorizes each product reviewed. The reviews even go as far as to provide you with an estimated setup time for the product in the classroom. 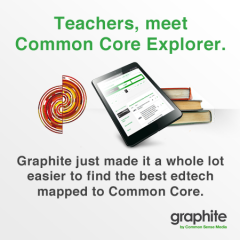 Graphite also provides teachers with a “Common Core Explorer” that allows them to find specific products that align with specific Common Core standards. They can choose a subject area (currently Math and English-Language Arts), and then choose a standard and see the plethora of apps that are available for meeting that standard in the instruction of their students. Graphite allows users to signup for the site and become active members of a PLC. Members can write field notes (mini-reviews) for products, use them in app flows (technology infused lessons), and create their own boards (similar to Pinterest) of product that fit specific needs that they outline. By meeting certain criteria with their field notes, app flows, and boards, teachers can earn a certification as a Graphite Certified Educator. For more information about Graphite, visit http://www.graphite.org. For information on how to become a Graphite Certified Educator, visit http://www.graphite.org/certified.